Former Democratic Colorado Gov. John Hickenlooper announced Monday he is running for president. “I’m running for president because we need dreamers in Washington but we also need to get things done,” he said in a video. “I’ve proven again and again I can bring people together to produce the progressive change Washington has failed to deliver,” he added. In his video, Hickenlooper spotlighted the challenges he faced during his first term as governor, from the historic recession to devastating droughts and forest fires and floods to the 2012 mass shooting at a movie theater in Aurora. “We beat the NRA by enacting universal background checks and banning high capacity magazines,” he touted. 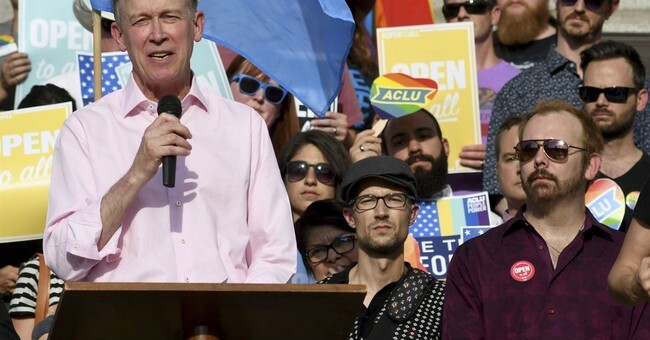 Hickenlooper joins a crowded field of Democratic candidates vying for the party's nomination in 2020 and is the second governor to join the race, with Washington state Gov. Jay Inslee making his announcement last week. “John Hickenlooper is the latest tax-and-spend liberal to join the race. But according to Hickenlooper, he’s actually ‘a lot more progressive’ than his far-left opponents. In a primary dominated by socialist policies like the $93 trillion ‘Green New Deal,’ that puts him way outside the mainstream,” RNC Communications Director Michael Ahrens said in a statement about the governor's announcement.